Summary: The project will purchase a portable, water resistant ultrasound for use at the Volusia County Marine Science Center. Two different transducers will be purchased with different footprints and depth so the ultrasound can be used on all sizes of sea turtles admitted to the hospital. The ultrasound will be used as a diagnostic tool for all sea turtles admitted to the hospital. In addition, the veterinarian and trained rehabilitation staff members will use the ultrasound for ultrasound guided needle placement when administering IV fluids such as total parental nutrition to reduce the risk of extravascular administration. Results: The grant has provided the funds which purchased an Ibex EVO Portable Ultrasound System with QWERTY sealed LED backlit keyboard; imaging modalities; AC power supply; 8.4 inch LED screen; EVO streaming with WIFI and direct connectivity; a CL3E Curved Linear Transducer; and a storm case for the unit. The ultrasound has been immediately put to use as a standard diagnostic procedure for every animal that is admitted. 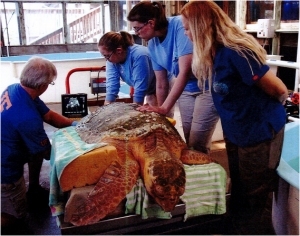 Having the ultrasound on-site has already reduced the stress that a turtle incurred when previously it had to be transported to a local veterinary clinic to have an ultrasound performed. Now this procedure is conducted on-site.